You can add task pins to photo slides to create a quick and easy to understand visual on how the room should be staged. You can also use task pins to point out where in the room the task should be performed. If you say “turn on the side lights”, your service provider has to spend time locating the switch for the side lights. Using task pins shows the service provider where the switch is located in the room. 1. Click anywhere on the photo. 2. Select the task for that pin. After you add the pin, you can write instructions that will appear inside it when your service provider taps on it. If you’ve added a task pin to a photo slide but feel the task needs more explanation, you can add a note to the task. 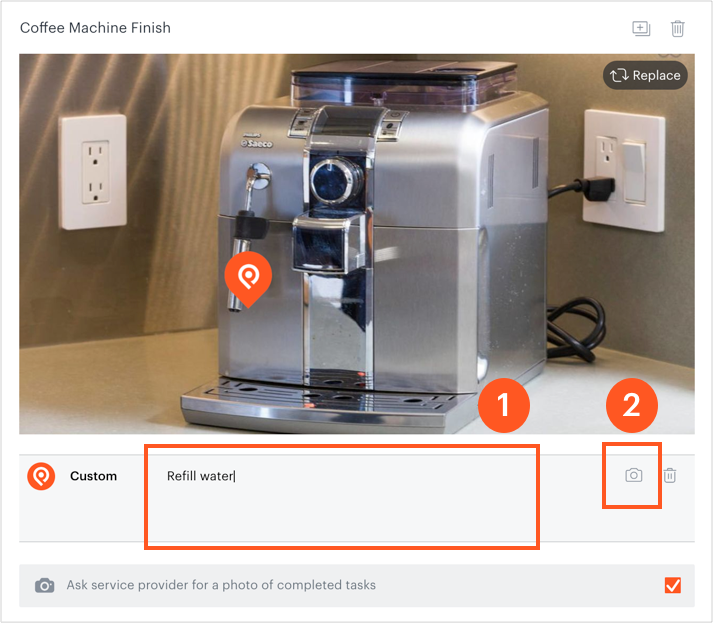 If you’ve asked the service provider to clean the coffee machine, for example, you can add notes to show how to perform each step of the task. Add text notes by writing them next to the pin underneath the photo. Click camera icon to add extra close up photo. To delete a task pin, click on it to select it, and then click on the trash can icon on the upper right hand corner of the slide.